Ergonomists are not some kind of ‘shrink’, dropping in to check whether control operators are happy in their jobs. Neither is their work confined to checking whether seats are properly adjusted, rooms are properly lit and the temperature is just right – although admittedly, these aspects do form part of their analysis criteria. 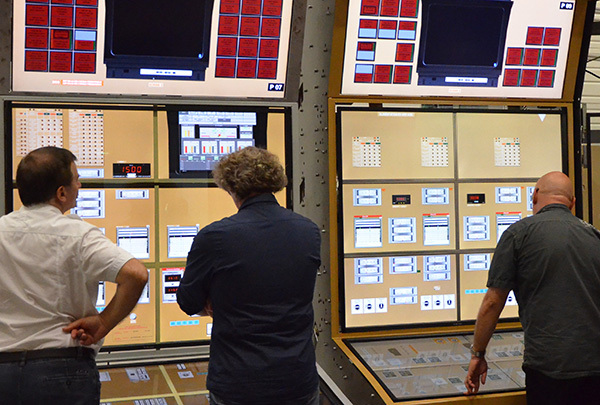 In the wholly new world of digital control rooms, ergonomists, supported by many other nuclear experts, check that the whole “human-interface-procedures-organisation” system ensures the control room crew performs safely, reliably, and well – during normal operations as well as during incidental and accidental operations, and during the very unlikely event of Severe accident. This is a vast remit. If there is any outstanding doubt or a definite flaw in the system, ergonomists also recommend changes in design choices or their implementation. These will be validated during repeated testing trials, in an iterative approach that is used throughout project life cycles. The purpose is to provide regulatory bodies with an assessment of staff performance that is one hundred percent “robust”, to make sure that everything works effectively and safely in all circumstances – a prerequisite for obtaining an operating licence. Looking at things from an ergonomist’s point of view is an instructive way of realising just how big the gap is between the hard panels of a conventional control room and the monitors in a digital facility. Indeed, ergonomists have noted four key differences. Digital technology is now standard for all new reactor projects, thanks to its ability to supply multiple sources of information, present it in synthetic manner, and analyse it – and its ability to control processes and automate certain tasks, such as diagnostic routines. The downside of all this is the risk of information inflation, as well as alarm inflation. The control team must not be submerged by a deluge of signals, as this would entail an incessant mental overload and increase stress levels during incidents and accidents. The question then arises as to how to strike the correct balance. One result of computers taking over large numbers of operations and control algorithms is that the processes underway are becoming less transparent: operators no longer have direct contact with the plant. There is no longer a direct link between their actions, such as lowering a lever or turning a button, and a valve opening or a pressure adjustment being made. The question is whether this disconnection disrupts’ operators’ ability to assess situations and take decisions. Experienced professionals entering a conventional control room can grasp the status of a unit in just a few seconds. They get a feel for the atmosphere, glance at the panels, observe operators’ positions and activity, and overhear their conversations. In a digital control room, these signals are attenuated or even entirely absent. A number of monitors and views need to be consulted to put together an overall picture, with the risk of being lost in a flood of information. This is what ergonomists refer to as the “tunnel effect”. The significance and potential impacts of this need to be measured and assessed. In a traditional facility, everyone perceives what their colleagues are doing simply by observation: where are they? what are they doing? are they calm, concentrated, or under stress? In a digital control room, each member of the team is immersed, or indeed ‘sucked in’ to their own computerized interface. This is known as the focusing effect, and leads to less oral interaction. At the same time, operators cannot extract as much information as they previously could simply by observing their colleagues. As a result, specific procedures to ensure efficient and well-coordinated operation are called for. This is all the more the case in those countries in which employees at work are expected to say little, or indeed nothing at all. For instance, after accident scenario tests in an Asian country, I requested that procedures should incorporate more oral coordination breaks for the staff, with the aim of ensuring good cooperation, which is vital in such circumstances. The performance of the crew in digital control rooms cannot be measured on paper. The change is simply too profound, and the issues involved too vital. Neither can one simply do with using routine and predictable scenarios. The robustness of the new working approach must be tested to the limits. These considerations naturally lead to HFE testing being carried out using fullscope simulators. These ensure realism, flawless memorisation of the tiniest details of scenarios that can regularly last as long as three hours, and infinite possibilities when it comes to replaying and analysing the most critical moments. does the team complete the scenario within the required time, and without aggravating situation due to human operators? is the mental load of the team acceptable, including in situations involving complex accidents and high levels of risk? how good is the team’s understanding and knowledge of computerised interfaces? Are the latter used exactly as they should be? does the operating crew understand the plant status correctly? Does it anticipate its probable plant evolution accurately? Is there ‘organisational resilience’ (any errors by a colleague are corrected by others on the team)? what is the impact of new control solutions on how the team communicate? On their coordination, and on the adjustment of roles and responsibilities? Dina Notte has worked for 35 years in the design of computerised control rooms and HSI (Human System Interaction) in complex industrial processes with high operation risk profile such as nuclear power plant, petrochemical sites, railways traffic controls, steel industry and telemedicine. She is now working as a Human Factor Expert consultant and participates to a worldwide expert’s workshop on Integrated System Validation of NPP Main Control Room under NEA (OECD Nuclear Energy Agency) funding. She is member of the HFES (Human Factors and ergonomic society) Society and has been general secretary of the French Ergonomic Society during six years. She is Certified European Ergonomist since 1995 and invited professor in several universities in France and Belgium.